As what you can notice since last week Shanghai was snowing quite often. This year is actually the thickest snow i've ever seen in 4 years when i am in Shanghai. What i like about snowing is the temperature was actually not that cold and still bearable, which is why i prefer it to snow rather than the wind blows. This particular time, i was trying one of my new blue puffer coat from Stradivarius that i got online on 11.11. To be honest, i rarely use puffer jacket, but because i was going on a trip this week into this very snowy and windy place, i kind of giving this jacket a try whether it will keeps me warm or should i think of something thicker. Lately i've been in love for pairing oversized sweater with skirt and this lovely boots. Not to mention that i got some ribbon details on the oversized Zara sweater that i got last year and finally had a chance to wear this sporty sweater. On both shoulders are stitched with some metal circle things to put the black ribbon into and on the bottom sides as well. At first i was quite hesitate to pair it with this metallic flare skirt i got long time ago from H&M, but it turned out quite nice and decent. 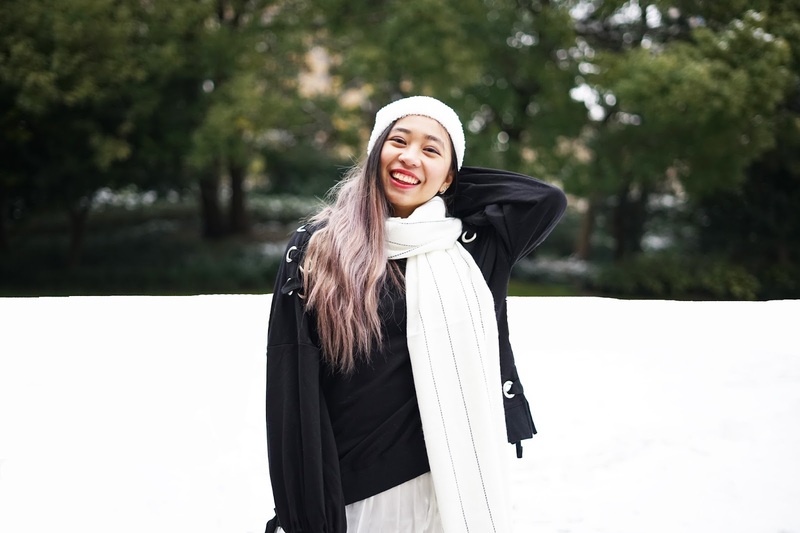 In order to prevent catching some cold and avoiding getting my hair wet from the rain snow, i decided to wear this cute beanie from H&M and this warm scarf i got online, and it seems like i almost blend in with the white snow background. However, i am loving this overall look, and even though the puffer coat is oversized (i got it in L) because i can always put another layer inside when i am feeling cold. It is just about getting warm and comfortable in your own outfit for this season. You can also double the top inside with something you would like, and also you can always change the color preference of your style. In this case, i am choosing for black and white monochrome feel.